Eight high school wrestlers from the Greene County area will begin competition in the 2017-‘18 state individual wrestling championships, Thursday-Saturday March 8-10 at the Schottenstein Center in Columbus. Legacy Christian has the most wrestlers going. 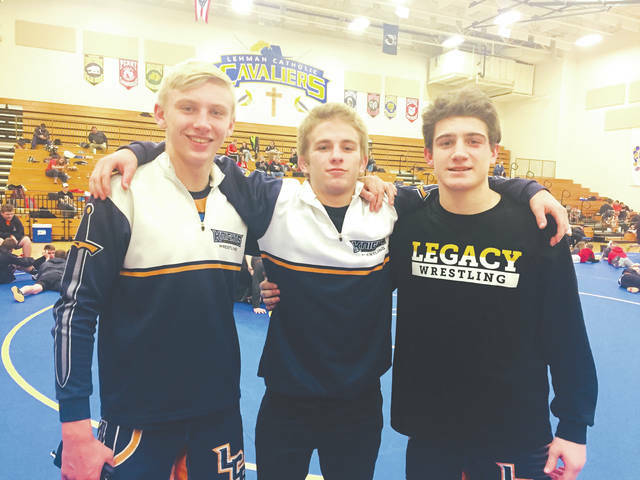 Left to right: Freshman 132-pounder Clint Brown, three-time defending state champ Tommy Hoskins (126 pounds) and freshman 152-pounder Dillon Walker will represent the Knights. 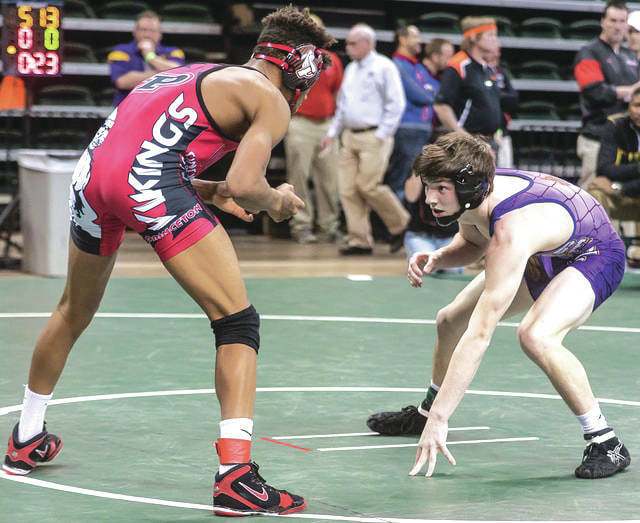 Bellbrook’s Ben Sherrill (shown at right in this file photo) will return to the state tournament and compete in the Division II tournament at 138 pounds. 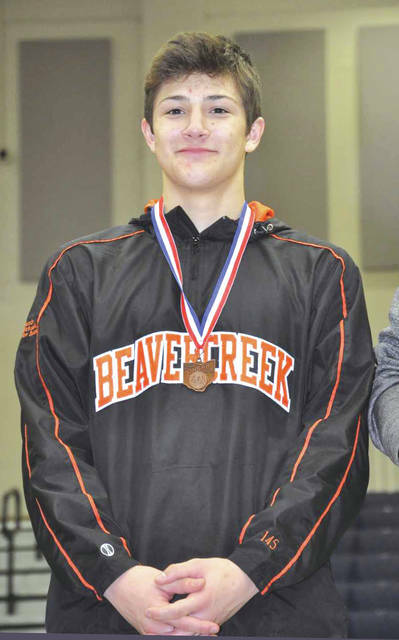 The Greene County area’s lone Division I wrestler to make it to state this season is Beavercreek’s Gavin Bell, a returning state qualifier who will wrestle at 138 pounds. 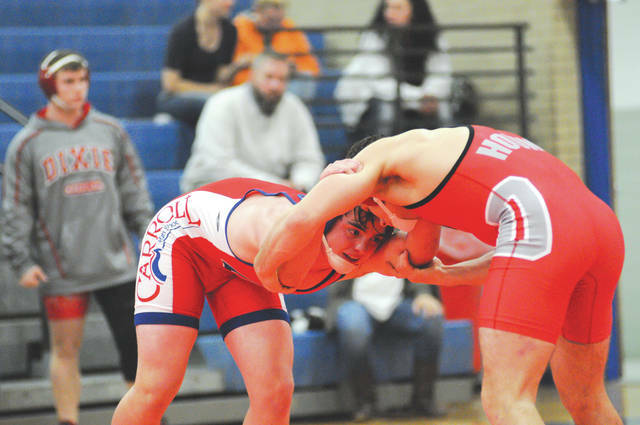 Carroll’s Blake Coy, shown in this 2016 file photo at left, will compete in the Division II state wrestling tournament in the 170-pound weight class. 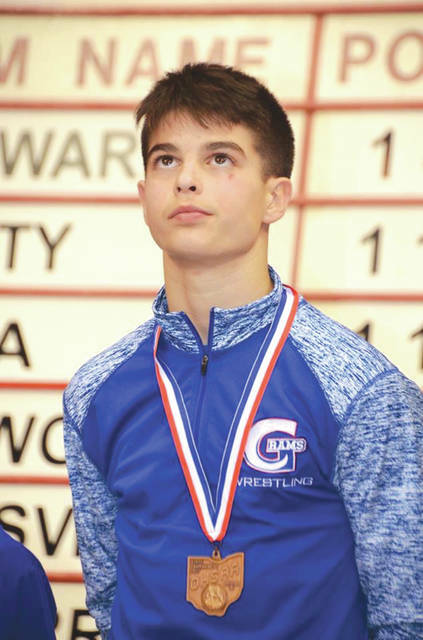 Returning state placer Devan Hendricks (shown) and Teagan Hendricks, of Greeneview will wrestle respectively in the 126- and 106-pound weight classes at the state Division III tournament. https://www.fairborndailyherald.com/wp-content/uploads/sites/50/2018/03/web1_LCAWrestlers_PS.jpgEight high school wrestlers from the Greene County area will begin competition in the 2017-‘18 state individual wrestling championships, Thursday-Saturday March 8-10 at the Schottenstein Center in Columbus. Legacy Christian has the most wrestlers going. Left to right: Freshman 132-pounder Clint Brown, three-time defending state champ Tommy Hoskins (126 pounds) and freshman 152-pounder Dillon Walker will represent the Knights. Submitted photo. https://www.fairborndailyherald.com/wp-content/uploads/sites/50/2018/03/web1_BenSherrillHolidayTourney.jpgBellbrook’s Ben Sherrill (shown at right in this file photo) will return to the state tournament and compete in the Division II tournament at 138 pounds. File photo. https://www.fairborndailyherald.com/wp-content/uploads/sites/50/2018/03/web1_Carroll-Blake-Coy-Dixie-Isaiah-Pritchard_PS.jpgCarroll’s Blake Coy, shown in this 2016 file photo at left, will compete in the Division II state wrestling tournament in the 170-pound weight class. File photo. https://www.fairborndailyherald.com/wp-content/uploads/sites/50/2018/03/web1_HendricksPodium_PS.jpgReturning state placer Devan Hendricks (shown) and Teagan Hendricks, of Greeneview will wrestle respectively in the 126- and 106-pound weight classes at the state Division III tournament. File photo.